Accepting the new offer will automatically cancel a previous acceptance. Didn’t get what you wanted on the first pass? We’ve got the latest points from every institution. Sarah O’Hara did not get a university place after she failed to get the maths grade needed. But she did a PLC course and ultimately got into the course she wanted. Threshold’s Michael McCarthy Flynn talks about ways to protect yourself in the rental market. 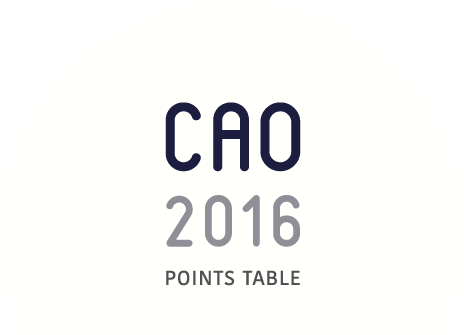 CAO 2016: Where are all the applicants coming from? There are over 80,000 people waiting to hear if they’ve landed their favoured college spot. The CAO offers are out now - What happens next? Other courses requiring high points include dentistry, medicine and computer science. Do you have what you need for your preferred course? Every course, every third-level institution: we have you covered. In 31 out of 36 subjects, female exam students topped the class. Six students received eight A1s in this year’s examinations. A1s are down but there’s a few positive trends as well. Nursing saw the biggest increase in applications since last year, while arts and social sciences had the biggest drop. It’s important to pursue a career that you want and are confident you can handle, writes Clive Byrne.